The Utility Muffin Research Kitchen is the name of the recording studio that Frank Zappa built and used extensively at his home for many of his recordings. The studio was completed on September 1, 1979 and the recording of several songs that were eventually released on the album You Are What You Is began in July, 1980. 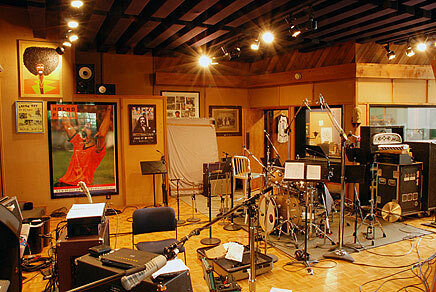 Today Dweezil Zappa record at UMRK and mixes his numerous album, live and archival projects there. Frank Zappa: "One reason we use the echo chamber is that certain types of percussive sounds, when introduced into a digital reverb program that may be a long program, don't sound right. That program may be good for everything else in the composition that is not so spikey. But the spikey stuff in there tends to sound bogus. So what we do is use live echo quite often for the percussion-type things, and use echo programs with more harmonic content on the strings or brass or things whose duration you want to increase." Arjen: "So 22 years later, when I saw a tech support email from Dweezil in the Audio Ease mail box I took the opportunity to ask him about that room. A couple of months later Aram and I took the day before the NAMM show and went up to the house to team up with Dweezil and Richard. We recorded the studio live room with our DPA 4006 TL's and the adjoining echo chamber using the speaker and microphones that were in there. Luckily they were set up exactly the way Frank had left them, showcasing Dweezil's dedication to authenticity." 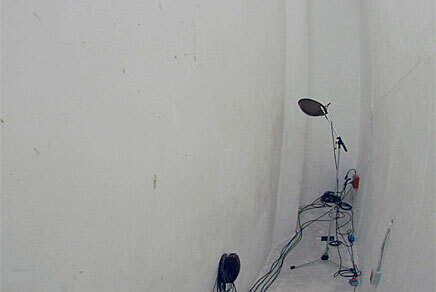 For background information on the echo chamber I later contacted Mark Pinske, the engineer with the most experience with the room. He told me: “I remember almost everything we did in the large chamber.